Home Tags Posts tagged with "lisbon portugal"
On Tuesday night, Cristiano Ronaldo and Rihanna met up backstage at her concert in Lisbon, Portugal. 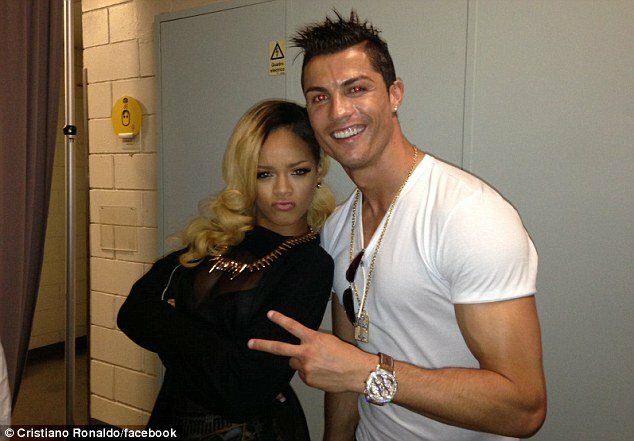 Real Madrid football player Cristiano Ronaldo posted a picture backstage with Rihanna following the show, flashing the peace sign as the singer pouted next to him for the camera. It’s not the first time Cristiano Ronaldo has made headlines by posing up with popstars. Last week, the sportsman met One Direction at the Spanish club’s training ground, as the boys took some time out from their whistle-stop European tour to train with Jose Mourinho’s men in the Spanish capital. At the end of their brief kickabout, three of the band members enjoyed a meet-and-greet with the manager, who presented them with a Real Madrid shirt, before they caught up with the players. “They told us that we had the opportunity to come to see the Real Madrid players and that was very exciting for us,” revealed Niall Horan.